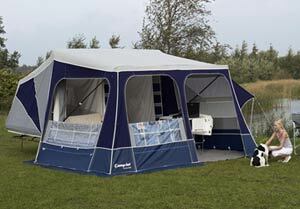 All Camp-let Trailer Tents have a hard top fibreglass trailer. Folding Campers and the majority of trailer tents produced by other manufacturers use a soft PVC cover to reduce manufacturing costs. Although producing hard top trailers is more expensive the significant advantages make it worthwhile. The minimum amount of storage space inside a 5th generation Camp-let trailer is equivelant to 10 full crates of beer. This does not include space taken up by canvas, framework and mattresses which also fit neatly inside the trailer, but is space you can pack with luggage. In addition to this is the rear swing out kitchen which has room for all your cooking utensils, pots, pans, cutlery and more. The hard-top of the Camp-let and its lockable rear door mean your luggage within the trailer is secure when you call in at services or have your trailer packed on the drive at home. Folding Campers and Trailer Tents with PVC covers are unfortunately easily accessed by thieves. Items stored inside the rear of the Camp-let trailer and within the swing out kitchen can be accessed by you en-route. By having a hard top trailer, the Camp-let allows you to carry awkward and bulky items on the lid. Boats, bikes, fishing gear, golf clubs and other items can be taken on holiday for your pleasure. An optional alloy luggage rack is available for the latest 5th generation Camp-lets. Unlike racks for soft top trailers, the Camp-let luggage rack does not need to be removed to erect the tent. Once you have unloaded the top of the Camp-let the bike rack and / or luggage rack stay attached to the trailer whilst you are camping. Bike racks for 2,3 or 4 bikes are also available for all Camp-let trailers. Alternatively, a transit cover can be added to protect your trailer from stone chips and dirt while travelling. An expansion zipped transit cover is also available to enable you to carry extra items of luggage. Meaning your extra items and the trailer are protected from the elements during transit. Camp-let hard top fibreglass is long lasting, UV resistant and keeps its looks. Taking a few precautions you can store the trailer outside without worry. If you have a garage or covered storage all the better. Unlike trailers with soft PVC covers that can discolour, degrade relatively quickly and will need replacing, the Camp-let hard top goes on and on. And, if it does get dirty, a fibreglass hard top trailer is easier to clean. A Camp-let can be cleaned with a hose pipe and sponge and kept looking new with car polish and a bit of elbow grease. If you have covered storage we recommend this is best but, if not, a breathable storage cover will protect the finish of your trailer from tree sap, birdlime and other marks.